Over the summer I read a fascinating book called Creating Space:My life and work in indigenous education, by Verna J. Kirkness. It was a fantastic account of Verna’s vast experience in the education system, from her experiences as a student to working on government projects aimed at transforming the education system for First Nations, Métis and Inuit students. 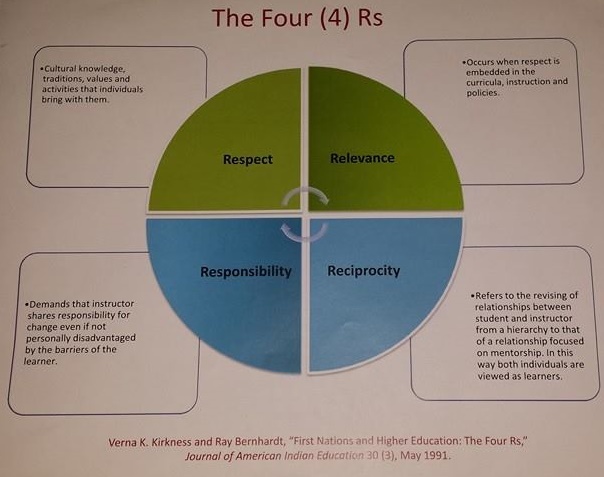 I was truly inspired by Verna’s story, so when I was looking through some of the research material I had collected and came across a diagram that she helped to develop about the Four Rs I know I had to incorporate it here for others to see. This chart reminds me greatly of the medicine wheel as it to is circular in nature as are most things in FNMI knowledge and teachings. The First R is for RESPECT. Respect cultural knowledge, traditions, values and activities that individuals bring with them. The Second R is for RELEVANCE. Relevance occurs when respect is embedded in the curricula, instruction and policies. The Third R is for RECIPROCITY. Which refers to the revising of relationships between student and instructor form a hierarchy to that of a relationship focused on mentorship. In this way both individuals are viewed as learners. The Fourth R is for RESPONSIBILITY. This demands that the instructor shares responsibility for change even if not personally disadvantaged by the barriers of the learner. If all teachers keep these four simple principles in mind when they are teaching, then their students will already have a more enriching educational experience.